Patterns are repeated shapes, colors, forms, and actions. Patterns are abundant in nature and in the built environment. We become aware of patterns through our senses, through observation, and through analysis. We see, hear, feel, touch, and taste patterns. We also study, match, predict, and test patterns. People create patterns in paintings, drawing, tapestry, tiling, carpet, buildings, streets and cities. People also create patterns in their daily routines and rituals. As the sun rises and sun sets, the magic of life is set in motion with repetition, frequency, duration and interpolation! Patterns are fascinating puzzles to find, solve, and make! Simple patterns repeat, alternate, mirror, rotate and organize in different ways. For example, if you line up a circle and a square and a circle and a square, the next shape is probably meant to be a circle. This type of pattern is an alternating pattern. 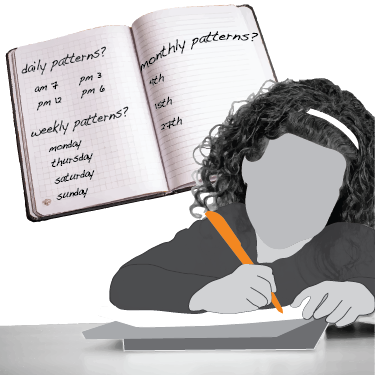 One way of understanding pattern is to uncover the motif or order of the pattern. In this activity, you will look at geometric patterns and reveal the repeating base. When observing shapes, or series of figures that repeat, it is also important to see the order created. Are they linearly organized? Do they form a mirror reflection? Photograph three patterns and with a marker, draw the organizing motif or model. Scientists, artists, doctors, economists, anthropologists, meteorologists, and environmentalists are just a few of the types of people who study data to understand patterns of activity or non-activity, increased motivation or decline. These patterns are subject to change over time based on multiple influences. Learning to detect, observe, analyze and understand patterns is essential to human survival. Our ability to recognize patterns becomes a basis for our ability to make predictions and form expectations. Look around your world. Pick a type of pattern that interests you, diagram it, and write a paragraph on how to best observe, record and analyze it. When we observe patterns, we want to describe and analyze them. Create and describe patterns. Find examples of these functional patterns (and more!) found in the natural and human-made world. First, stay indoors – inside your home, school, or public library. Take a sketchbook or camera and look for spheres, mosaics, spirals, – and record as many examples of patterns that you can find. Look in closets, drawers, exhibits, and even the refrigerator! Categorize the patterns discovered. What classes are missing? 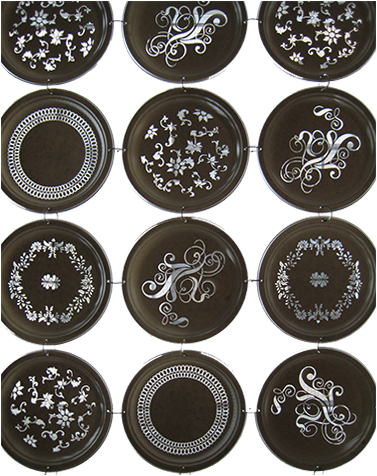 What types of patterns are most numerous? Next, take a sketchbook or a camera and explore outdoors. Can you find pinecones? What about polygons? Does nature make polyhedral patterns? Pay attention to the scale of natural and human-made objects as you explore the outdoor environment. Is the branching of trees similar to the pattern of branching you see in the veins of leaves? When you are done collecting examples outdoors, categorize your found patterns. List the categories and the number of examples of each type found indoors and out. Make notes about your discoveries to use the next time you look for patterns. You’re on your way to becoming a pattern expert! People create visual patterns at different times and different cultures for record keeping, pleasure, wayfinding and remembrance. These patterns develop into language and visual representations of events at different scales depicted in diagrams, symbols, drawings, and even sculpture and architecture. Draw along with this video of architectural patterns. They develop into trade routes and markings of habitation or settlements. Patterns made by people leave traces, or marks on paper, fabrics, buildings, cities and the earth. Human patterns follow migration routes, settlements, and reveal times of prosperity or periods of ill health and natural disaster and conflict. Look at The Grammar of Ornament by Owen Jones. 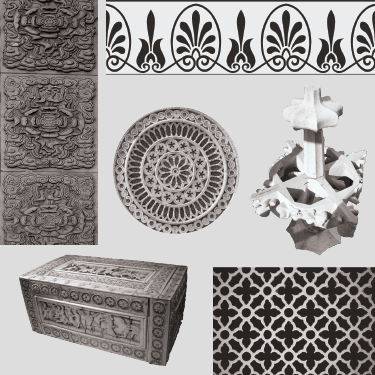 Pick a civilization and make a poster of its ornamental patterns. We make patterns in the snow or sand when we walk. We live in daily patterns of sleep and awake. There are patterns of weather; the seasons bring patterns of change. Flights across the earth make patterns. The stars and planets move in patterns. Create a representation of your life – a day or a week - using only dashes and dots? Think of the pattern of hours, days, and months that have marked your life. What memorable events punctuate the patterns of time you’ve experienced? Are the days of the week equal in experiential time? How does Monday compare to Saturday? What are the colors of your days? Use your favorite media to express the patterns of your life! Visual Patterns What's the equation?